Greek wine has made significant progress over the last few years. Nowadays much emphasis has been placed on the expression of the various terroirs, which, in combination with the amazing wealth of Greek indigenous varieties, paves the way towards more sophisticated markets and points of sales. 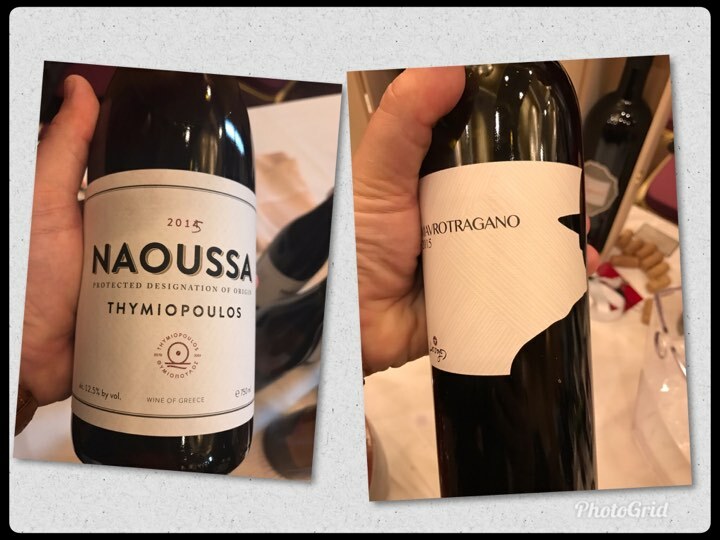 I recently tried two wines which impressed me with their character and their aura; the soon to be released Naoussa 2015 by Thymiopoulos and the first official release of Mavrotragano by Dougos. Let me start with the Naoussa by Apostolos Thymiopoulos. This is vinified with about 70% whole clusters bringing an aromatic left on the nose and more texture on palate. The production amounts to approximately 200.000 bottles, which enclose an elegant and complex wine. The label and bottle stay true to the wine - simple and elegant. It is truly admirable how Thymopoulos manages to give his Naoussa such precise balance, delicacy and fruit maturity. I asked him about all of this during the Umami Festival in Larissa and Thymiopoulos was very willing to open a discussion.
'' The grapes are sourced from the coolest terroir in Naoussa called Fitia, a mountainous region that rises to 450 m altitude and features a mosaic of soils. There is an abundance of schist, but also different types of granite. Generally, such types of soils are poor in nutritional elements, which produce wines that are fine and delicate in character." "Up to now, there has been no attempt to produce an elegant Xinomavro, Most producers have focused their attention on making wines with high concentration, deep colour, and intensity of aromas, with the use of various modern techniques," he continues. "In this, soon to be released, Naoussa a more sophisticated character is revealed; a completely new perspective that nobody else has dared to pursue, partly because no one else has vineyards at this height and on such rocky grounds." The discussion warms up. I ask him about the difficulties and challenges he faces farming in terroir which is particularly extreme for Xinomavro. '' At this altitude, Xinomavro struggles to fully ripen, so the aspect of the vineyard plays a key role. In these circumstances you need skill and knowledge - there is not much room for mistakes. 99% of your results depend on how well you've worked in the vineyard. If your grapes are high in quality all you do is throw them into the vats to ferment. " I taste the Naoussa 2015, to be released very soon. It has a cool climate character and despite the fact that it is light, it has substance, thus showing off the power and energy of the mountainous terroir. It has beautiful floral and cherry-like aromas, that also include the tomato and truffle scents, the latter found in wines of top terroirs. A cool climate red wine that is produced from grapes grown in extreme conditions - a combination of stony terrain and altitude - that with only 12.5% ​​alcohol expresses so much flavor and gives Xinomavro another dimension. You can drink it from now and for the next five years (91/100) with a price close to about 13 euros in domestic market. Next in line is the Mavrotragano of Thanos and Louiza Dougos from the same 2015 vintage, released in just 700 bottles. This wine is amongst the best made of this variety. An excellent effort. The retail price is close to 50 euros. The very interesting element of the wine is that Thanos Dougos now confidently presents a more balanced and less oaked version of Mavratragano. '' In the first vintages we realised there was more vanilla than we desired and this masked the fruit a bit. So we reduced the effect of new oak to under 50%. I also think that in the wine of 2015 we have better balance because the alcohol levels marginally exceeded 14%. With more work in the vineyard these may be lower in the future." Grapes are sourced from vines that are almost ten years of age set in just 5 hectares of land in the area of ​​Kontariotissa in Pieria, Northern Greece. The altitude is 360 meters, and the soils contain the highly prized combination of schist with iron. The yields are kept low, under 25 hl/ha, and the wine matures in 300 lt barrels for 18 months, with an alcohol level of 14.2%. The colour is deep ruby, and despite its young age, the wine generously offers a combination of black fruit, bitter chocolate, crushed pepper along with earthy notes, and displays aromatic evolution. Impressive integration of oak and purity of fruit. On the palate the wine gradually reveals its power, but without becoming overpowering, and the tannins are present without being abrasive. A delightful wine that can be drunk now but will easily keep for the next six years. (92 +/- 100).